The Contemporary Arts Center Cincinnati currently presents the first solo museum exhibition by world-renowned French artist JR. 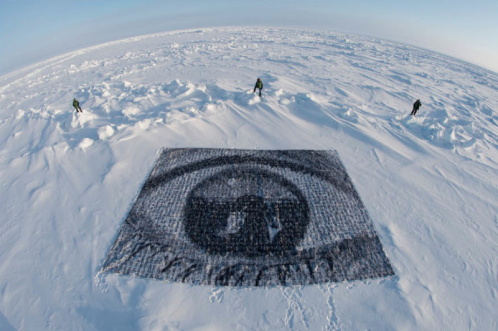 The show features more than a decade of JR’s work seen in public spaces around the globe. 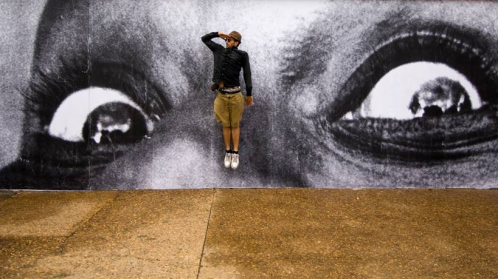 Describing himself as both an “urban artivist” and “photograffeur,” JR has won international acclaim (including the 2011 TED prize) for postering arresting black & white portraits of community members upon a variety of city surfaces. His museum show celebrates the breadth and ambition of what JR dubs “Pervasive Art,” reflecting his interventions by way of wheat pasted images, photography, video projections, sculpture as well as a mobile photobooth. This booth will be housed in a van that travels to multiple locations across greater Cincinnati – giving a facelift to the city through images of its inhabitants. JR also created new video projections for the exhibition and premiered a work in the CAC lobby during the Member’s Preview at the September 20th opening.